Lowering Bad Cholesterol - A Diet Change or Medication? 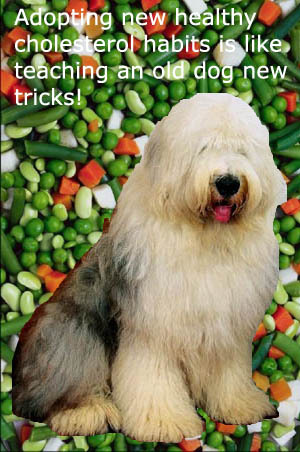 Ever since I became interested in lowering bad cholesterol through lifestyle modifications, I have wondered whether I am really trying to teach an old dog new tricks. I mean, although I am sure at some point in my life I was hovering around my ideal cholesterol level, my diet has been pretty much the same since I became an independent adult. Yes, my cooking may have improved somewhat and I obviously tried to give the twins a healthy choice of meals as they were growing up. But when it comes to me, I have always been drawn to the very foods that now seem to be a big cholesterol no-no. Can I, therefore, really reeducate my middle-aged brain-and belly-and introduce a diet into my life that will ensure I am lowering bad cholesterol? Or will I ultimately end up relying on cholesterol-reducing medication? Lowering Bad Cholesterol Becomes More Important With Age. They are over the age of 40, in particular between 55 and 65.
they have a family history of cardiovascular disease or strokes. This was particularly worrying for me, as not only did I sit comfortably in the at-risk age group, my sister had been diagnosed with high cholesterol and the early signs of cardiovascular disease just before my own visit to the doctor. I was worried because I had been hoping to start lowering bad cholesterol through diet modifications. While this could still be possible, if I was really as prone to high cholesterol as it would seem it could well mean I would need specific medications to help me achieve an ideal cholesterol level. The British Heart Foundation Recommends Adults do not have an overall cholesterol level higher than 5.0 mmol/l. My cholesterol level had been just short of 6.0 mmol/l, which had concerned my doctor but he had been quite surprised that it was not higher given my diet admissions. Once I learned that I fell in to the more risky groups for high cholesterol, I decided to research possible medications that may help reduce my overall level too. I am still focused on lowering bad cholesterol as naturally as possible, but I need to acknowledge that doing this through diet alone may not be a choice I am given. 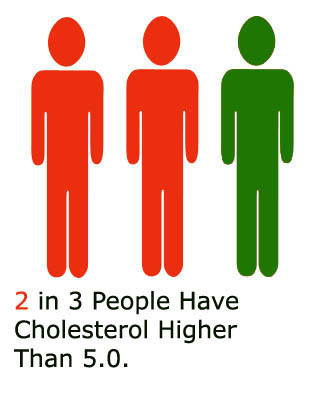 Lowering Bad Cholesterol is a Major Health Concern; 2 in 3 People Have Cholesterol Higher Than 5.0. To discover that almost two-thirds of the adult population has high cholesterol was shocking to me, however, there was a small silver lining. Of the individuals who scored higher than a five on the cholesterol test, around 60-percent were able to start lowering bad cholesterol in their system just by making important lifestyle modifications. This usually included eating healthy-reducing the amount of fat in their diet, stopping smoking and introducing some form of exercise into their daily routine. People who had to take medication to try and achieve their ideal cholesterol level usually have a cholesterol level above 6.0 and struggle to make positive changes to their diet and lifestyle. Issues such as obesity, diabetes and disability can make it difficult for people to change their diet or introduce exercise into their life. Although I do have the odd ache and pain, I am lucky in that I can make positive changes without having to consider my health first. Lowering bad cholesterol through medication; The easy way out? Medications designed to lower a person’s cholesterol level are prescribed usually when a medical professional has serious concerns that without it the patient is at risk. Cholesterol-reducing medications are not a quick fix, they do play a serious role in a person’s heart health. However, according to a study by Bristol University, it would seem that some people who take the medication are never informed that they may have other options. Medication designed for lowering bad cholesterol advertised as a long-term need. Statins, the medication most commonly prescribed by doctors to people who have high cholesterol, are often marketed as a long-term drug. That is, many individuals believe they need to take these drugs for the rest of their life in order to achieve a healthy cholesterol level. During my quest to improve my lifestyle, and therefore my own high cholesterol score, I have discovered this is not the case at all. For example, when a person experiences pain they take a painkiller to deal with that pain. It doesn’t cross their mind to take the painkiller long-term and it is the same with medication used in lowering bad cholesterol. People with a high risk of heart attack or other problems usually have a cholesterol level of above 7.0. In cases such as this, doctors recommend the person take statins, to being the level back to a manageable range. This does not mean a person needs to take statins for the rest of their life. In fact, most people who are actively lowering bad cholesterol with medication can do so in conjunction with a change in their lifestyle. Although I have a lower cholesterol level than most at-risk individuals, I was glad to learn that if I ever did need to use medication, it may only need to be a temporary measure. It is important to me that I continue lowering bad cholesterol as naturally as possible, which is why I have dedicated so much time to researching the most appropriate changes to my lifestyle. However, it is reassuring to know that if my risk level ever did increase, I have the choice of achieving a healthy cholesterol level using medication without having to rely on it for life.